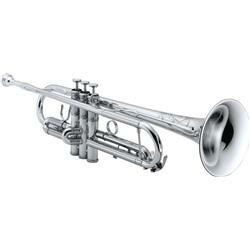 XO professional trumpet features include a traditional yellow brass body available in bright silver-plate or high-gloss clear lacquer finishes. Handcrafted bells are provided in yellow brass for clear quality of tone. Rose brass bells are also offered for those who prefer a slightly darker timbre. The 1600i features a .453" bore, yellow brass body and a 4.8" handcrafted B1 bell with heavy bead and enhanced bell ferrule. The combination of these two features creates an instrument with exceptional dispersion, clarity, and tone. This model also features a reverse leadpipe and professional two-piece valve casing with nickel silver balusters and includes stainless steel valves and a vertical third valve stop. Also included are the special XO Nodal Stabilizers that reduce the gaps that normally contribute to turbulence and excessive resistance.